In the buzz of a hyper-dynamic world with everyone’s eyes locked on a mobile screen it can be hard to break through the clutter. So how to do you get the public to notice and care about cultural education and histories? The biggest hot moment is probably when you’re launching your new exposition, and the targets are in focus. Reviewing some archives last week I stumbled across an old photo of these excellent exposition by the Museum of Ethnography (MEG). This stunning boardwalk communication campaign came out for the exposition on the Amazon, “Amazonie” in May 2015. 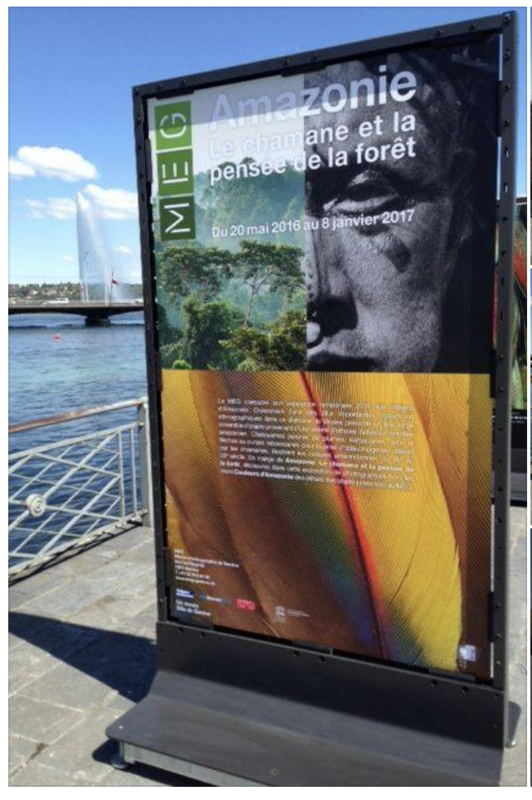 It was unmissable, literally – advertised along the boardwalk in Geneva, Switzerland, with a series of billboard posters walking you through the highlights of the exposition and leaving you hungry for more. Here are 3 great things the MEG did with this campaign, and a few tips for even higher visibility and visitor attraction. The Museum of Ethnography example is fantastic because of the appeal of the billboards, and the authentic experience it offers, in the right location. Here are what I would call out as the 3 secrets for success. These billboards catch the daily traffic along Geneva’s famous boardwalk, Quai du Général Guisan, catching the tourist crowds wandering along the famous Monto Blanc bridge. It is designed to catch the attention of a great mix of local and foreign visitors, in a location that gets traffic. Furthermore, it is symbolically a tribute to the Amazon, and also to Geneva and the role of water in both locations. The marketing execution is a communication campaign and an exposition in its own right, becoming part of the city and contributing to the place-making of Geneva as a city. These adverts provide a unique and authentic experience that extends the museum reach all the way through the city – walking along the boardwalk is an experience in its own right. The exposition isn’t afraid to shout, with vibrant colours and different visual stimuli to catch the attention as the crowds walk by. Each poster is curated with an excellent link back to the museum opening, with the front and end posters offering the full details. In my experience, so many advertising posters for the cultural sector are text heavy, so the public gets lost in the message or meaning. The exposition doesn’t stop at the boardwalk, but gets a chance to be relived via the social media channels, with reposting via the Facebook site. Whilst this should be second nature, it’s a critical step to keep sharing and getting visibility and public outreach. Currently this seems to be set up purely with organic re-sharing and comments, and there could be even more benefit from some combined paid communication. Granted, this execution comes from almost 2 years ago in 2015, and looking forward here are a few of the ideas that could bring the exposition to an even wider audience. By the way, if you’re in Geneva, here’s a teaser of the new expo – check out the Totem magazine for details, or come buy for the opening evening on May 17th 2018. Of course every location and destination has different challenges. Why does a visitor choose to visitor (or not to visit) a museum, once they know about it? Whilst some factors can be very hard to control (weather and sunshine versus rain is of course key), there are other common steps that can help lead to a final visit. It should be an obvious step, but so often cultural communication campaign miss the link back to the exposition and a clear call for action… this is still the case in this campaign, where the public gets a quick and immersive feel for the exposition, but doesn’t have any reason to get up and go… now! Typically a new exposition will be packed for the opening weeks, and then taper off…. so a call for action could even aim to bring in a steady stream of visitors in later weeks, like 4 or 5 weeks after the opening. Highlight a special event or gap where and when you want to bring in your visitors and focus on building your visitor attendance for the days that matter. Geneva is a very small city, and while the locals know it, tourists may not be aware of how accessible everything is. It could be a simple map or QR code showing how to get to the museum, or a more creative technique like printed footsteps on the floor leading the museum could be a huge attraction technique. Its a quick, interactive experience to let people know where to go, and you could even add distances (500m, 100m) so there’s a sense of urban location. The photo below is a share-and-reapply example from another cultural destination in nearby town of Chambery, France. 3. If its free, shout it out! The cost of entry is almost always a deterrent for visitors, no matter what the industry. But the advantage for the cultural sector is that so often there is a subsided or ever a free component that can be enjoyed by the visitor. If there’s a special free evening or weekend, bring this to life on the posters and in your communication. Likewise, if the museum is part of a museum group pass or loyalty card this should be called out. Make it easy for a user to find the best deals for their visit. Make sure this message is really bold and clear on all communication materials, so that the public knows the investment they need to make. It shouldn’t be hidden in the small text. Also, for many museums the permanent exposition is free, this can always be a nice message to bring visitors to the museum doors to experience the expositions and the museum space. Use follow-up loops like social media to remind visitors. But one watch-out – if people make the effort to get to the museum, they should at the very least be given an opportunity for an educational teaser and mini-experience to highlight the exposition, even if they aren’t willing to invest in the entry ticket. Make sure some part of the exposition is shared in a public area, like the main gallery or entry hall. The general public will appreciate this experience, even if they are willing to invest in the full experience. Looking for more information? Read the article on Chambery Old Town walking tour. The Chambery tourism office offers a fantastic “guided-walk” in the old town using little painted symbols to guide you through the city centre. It’s a fun and creative experience that any cultural institute can bring to life.